Connectrode [$0.99] has it rough. At a glance, you might mistake it for a match-3, and it ain’t easy to stand out on the app store as a match-3 these days. 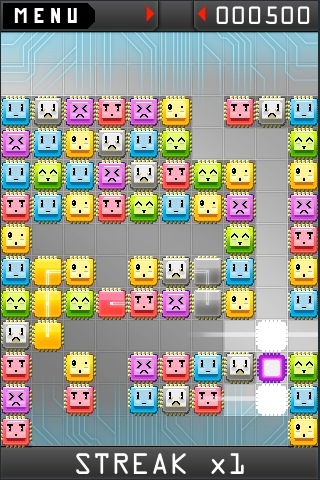 It’s probably even worse when you’re an awesome puzzle game that just happens to look a bit too much like one. So let’s clear up that assumption. While there’s a fair bit of color matching in Connectrode, there’s no sliding or swapping to deal with, and no timers to beat. Instead, you’re presented with a board of static, adorable computer chips. 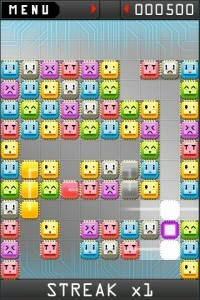 The only way to clear them off the board is to link them up with their matched partners, and to do that you’re given a series of colored connectors. These connectors can link chips up with each other if you match their colors, but you can only place them in spaces that are in a clear path from the top. Close off a section of the board and you won’t be placing anything into it until you clear some chips out of the way. That one little limitation may not seem like much, but let me assure you — it is. If you give Connectrode less than your full attention, it’s easy to slip up and place a connector somewhere that blocks off not only the connection you’re trying to make, but, say, the whole lower half of the board. Coming back from that might be hard, or it might be impossible. If you manage to clear an entire board, you’re awarded a high score. This gets interesting, because the boards are randomly generated. Traditional leaderboards don’t quite work for this set up, so Deep Plaid Games had to come up with a more creative way to share scores: when you complete a level, you can share your score with friends on Facebook or Twitter, and it includes a link that allows them to play a copy of your level. If you’re a purist, though, the developer has mentioned on our forums that Game Center integration is on the to-do list, presumably for sharing your top score on each of the game’s four difficulty modes. In the meantime, you can spend some time perfecting your high scores. Earning streaks (clearing chips multiple turns in a row) gives you a nice bonus modifier, so you’ll need to plan your line completion carefully to get the best possible score. You also earn bonuses for clearing more than two chips in a combo, and for clearing a color without leaving any single orphaned chips behind. Add all the factors together, and you’ll find a game absolutely requires you to plan a few moves ahead if you want a score worth noticing. Connectrode is everything I look for in a puzzle game. The game design is smart, and strikingly creative. As an added bonus, the art and interface are colorful and cute, and the music is quite cheery. If you like puzzle games that require strategy and thought, you’ll definitely want to pick this one up.